Replacing your air filter with a performance cold air intake system will allow for more air to enter the combustion chamber for additional performance. These gains come in the form of additional power, torque and fuel economy. 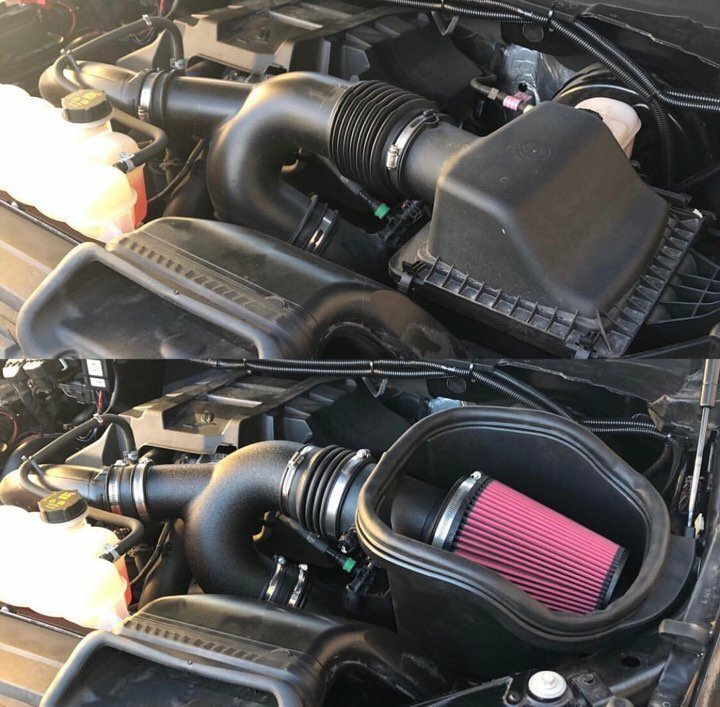 The best cold air intake is the K&N Performance Kit, which is designed to improve throttle response and engine sound with estimated horsepower gains of 10.68 HP. 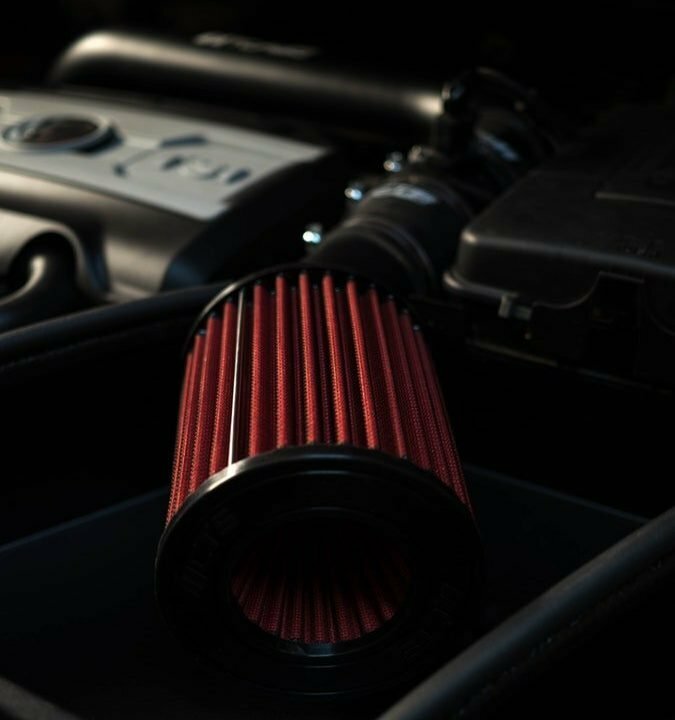 Upgrading to a cold air intake system over a restrictive air filter can be fairly straightforward depending upon the kit you choose. Some may require you to move the air box outside of the engine combustion but this has the benefit of cooler air. Improving the flow of cold air into your engine is one of the easiest and most effective methods of improving performance. Using a cold air intake will also produce the desirable induction noise due to the inrush of air into the cylinder of the engine. Not only is the quantity of air flow important but so is the coldness of the air. The colder it is, the more oxygen is available to the engine for further efficiency. The amount of benefits from adding this modification makes it a great investment. 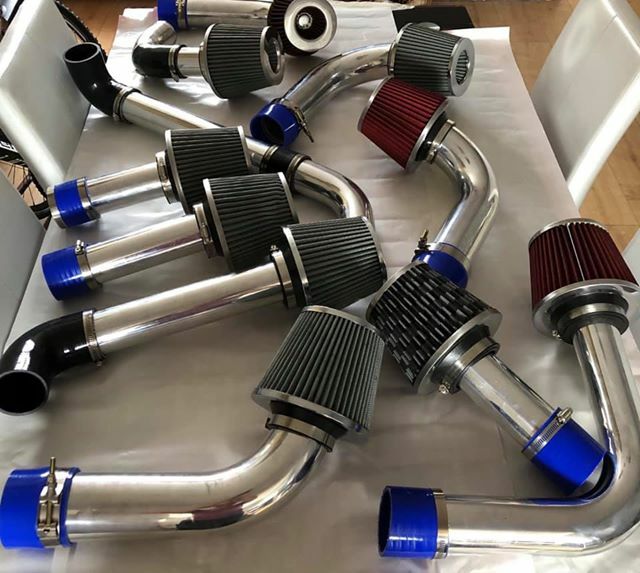 Below is a list of the best cold air intake kits that are easy to install and designed to improve performance with impressive horsepower gains achievable. When it comes to performance filters, K&N are the leading manufacturer. They are a global brand that design all their products to be performance based and their air intake is no different. K&N claim that their performance cold air intake system will improve your horsepower by up to 10.68 HP at 5,321 RPM. K&N also provide a black or chrome metal tube construction at an additional cost for those that want to make their engine bay look even more special. Overall, it is the best cold air intake that is designed to improve throttle response and engine sound. This particular system is suitable for an Escalade, Silverado 1500, Suburban, Tahoe, Sierra, Yukon, Denali and a few other models. K&N does offer various other designs that are suitable for almost any vehicle on the road. Spectre Performance is another popular brand in the US and their 9900 air intake kit offers excellent performance at an affordable price. Installation is simple with all the mounting hardware included and it uses a high quality polished aluminum tube for aesthetics under the hood. Overall, the Spectre Performance Cold Air Intake System is an affordable option when compared against the K&N alternative. It has been designed for horsepower and torque increases with a high quality construction. Unlike many of the alternatives, the Volant 15553 Pro 5 is an enclosed system, which has the benefit of avoiding the hot air located under the hood. It also has the benefit of being CARB exempt, which makes it legal in 50 states. If you require an enclosed system, the Volant 15553 Pro 5 is the best option. Features such as the cross-link polyethylene and over-sized closed air box allow this system to increase the air volume in order to maximize engine performance. When accelerating at high RPM, this will certainly provide noticeable horsepower increases. Airaid are a premium brand that specializes in air filters, intakes and other related accessories. The 352-210 is a performance air intake system that is available as an oiled or dry media depending upon your preference. Overall, it is a highly rated cold air intake that is CARB approved and provides excellent performance. It does come with a premium price tag but the quality of the kit and installation hardware along with the lifetime warranty makes it worthwhile. One of the cheapest system is this 4 inch cold air intake kit, which is suitable for a range of different vehicles. It has been designed to reduce the intake restriction and straighten the air flow in order to improve the performance of your vehicle. It may not be manufactured by a big brand but it is a quality system that will improve engine performance. For those looking for an affordable option, the Million Parts kit is the one to go for that is actually worth the money. When it comes to tuning your vehicle, you will want to begin with the easiest and cheapest steps first. Improving the flow of air into your engine is one of those modifications that is almost certain to improve horsepower and torque. This is because it allows for extra air to enter the combustion chamber, which allows the engine to run more efficiently. Most kits will replace your factory housing and come with all the mounting hardware to make it a straightforward swap. Installation requires no special tools and take just a hour if you know what your are doing. To help you make an informed buying decision, we have produced the below buying guide regarding cold air intake kits. It is important to note that if you live in California and intend on installing a new cold air intake, it must be CARB approved. The acronym stands for California Air Resource Board and is relevant due to the fact the upgrade can change the vehicles emissions. California law states that the intake system must have a CARB EO exempt number in order to be street legal in California. As the cold air intake will be technically tampering with the emissions, this would be an aftermarket part that would be checked. There are many CARB approved kits but you will want to ensure that the one you purchase has a CARB EO number to be street legal. Air intakes are not compatible with all engines and you will want one that is specific for your vehicle. Most brands provide full mounting hardware and tubes that are designed to fit without having to trim down or make modifications. To confirm that it is compatible, it’s recommended that you take measurements of your stock intake system size. This will give you an indication to the type and size of intake system you can install. Most brands will offer a vehicle configuration selector for assistance. As you can see from the cold air intake system below, the housing is completely changed but the tube is designed to be a direct replacement. An important feature of a cold air intake system is it’s ability to withstand the heat under the hood. If the air flow going to the engine is warm, it will not be as beneficial and although defeats the object of a “cold” air intake system. Certain materials used within the construction such as plastics or composites but so does having a thermal barrier coating. This will usually become in the form of a zirconium or ceramic coating that have excellent thermal resistance qualities. When it comes to components such as the mass air flow sensor, it is important that you consider the types of filter element. There are two types that include an oiled or dry filter element. If your engine uses a mass air flow sensor, we strongly recommend that you keep to a dry filtering element to reduce any issues. Oiled filter elements do have their benefits as they can last far longer and also catch more dirt particles. It really depends on your preference and which works best for your vehicle as some may require a certain type. Ensure that all the mounting hardware is available. Disconnect the car battery for safety purposes. Remove the stock filter housing and tube. Connect the battery and check for any odd noises. Take your vehicle on a test drive ensuring you hit high RPMs. Installation really is that simple but you can read a detailed guide for further clarification. If you do not experience any induction noise or performance increase, you should ensure that it is installed correctly before sending it back to the manufacturer. If you already have an air take system installed but are experiencing troubles, below are the three main symptoms that you may experience. Reduced engine performance – One of the obvious symptoms is a lack of power due to the engine not getting adequate air flow into the combustion chamber. You may be able to clean the filter out of any dirt or debris but it may be past that stage. Check engine light – When the engine is not getting enough air flow, the engine management/check engine light may appear. You will be able to confirm that the air intake is at fault by using a car diagnostic tool. High Idling – If there is too much air flow due a crack or leak in the intake system, your engine may start to idle high. Depending upon the type of engine, you may experience a whole range of symptoms but the three mentioned above are the most common. Investing into a quality cold air intake kit can make a huge difference to the performance in terms of power, torque and even fuel economy. They are easy to install and can add value to your car if you choose a reputable brand. All of our recommendations are suited to a range of budgets and are manufactured by reputable brands in the automotive industry.